He's making the case for his company, and its business model. What do you expect him to say? Apple, together with Microsoft, is one of the companies I trust more nowadays. Of course they'll both soak me for every penny they can, but at least they tell me up-front what I need to pay them and what I'll get for it. In short, they treat me as a customer, not a product. "at least they tell me up-front what I need to pay them and what I'll get for it"
They tell you that your keyboard will break if it gets dust on it? That the CPU will heavily throttle due to overheating if you use it for anything more than casual web browsing, or if it is a phone more than a couple years old? That any cable from them will biodegrade after a year or two of use because they dont want to use PVC? That their cases will dissolve and corrode from contact with skin? I think I found the fanboi. Isn’t this getting a bit tired? I know Apple’s PR pantomimes are more cringe inducing than Ricky Gervais feigning modesty, but at least they are trying to take advantage of the right things. In contrast, the slime oozing out of Google, Facebook, Oracle, Uber, Sherpa, 500, Transformation, .... can’t even pretend to know what the right thing is. I really liked the way the article was written. I wish a little more of the beauty of "old style English" would make its way back into the media. But what Cook said is just horrible. Business promotion aside, i just cannot accept if platform providers claim the right to decide what is "right" or "wrong". I think it was Voltaire who said "i hate what you have to say, but i will die for your right to say it"? Now that is an attitude i can 100% support. Society as a whole - i.e. each individual in it - has to learn again how to deal with "hate speech": ignore it. If it becomes slander or diffamation - then sue. We have become so weak and soft that we always scream for someone to protect us from "the bad" this and that. I think it is the same reason that we see so many brutal beatings in school and other places: the kids today never learned how to deal with violence. In my time, when someone was down, you stopped. Period. Now they start kicking. That is because they never were down and learned it. Anyway, i digress. If Apple does not want "hate speech" on their "platform", then that is their choice. But in that case, they should have terms and conditions that define clearly what "hate speech" is. So then someone posting it makes it *illegal*, which is something that does not deal with morality or ethics. The customer or user enters in a legal relationship with them on using their "platform". So make your response also legal, not based on "what is right". Apple has no moral right to ban people based on morality without becoming the same thing that they try to ban: full of hate and contempt for the person and opinion they ban. "We've only had one message for those who seek to push hate, division and violence," He said. "You have no place on our platforms. You have no home here." We're living in strange times if a) this is news in the first place, b) he said it in the first place, and c) there responses calling for "anything that is not specifically illegal should be publishable". Not every publisher should be obliged to publish Mein Kampf if they don't want to. The majority of people wouldn't even want to read it. And we wouldn't be in a good place as a society if they did. Everyone can and should exercise discretion using common sense because extremes aren't a good thing. We seem to have forgotten that. I think what's more interesting is how Apple is going to walk the tightrope in the future by exercising a small degree of editorial control (by saying what can and cannot be published on its platform) but also avoiding liability for defamatory or otherwise dodgy material that's published on its platform (because it didn't decide what the content was). This has been covered on El Reg before. "I think it was Voltaire who said "i hate what you have to say, but i will die for your right to say it"?" By the way, publishing material that's against a platform's terms and conditions isn't illegal - it's just a breach of contract. I'm afraid the picture desk has been using a picture of Paul O'Grady again. For Lo, to moralising there is no end and the eradication of hate is not within his power. His circle of purity will become ever tighter until it is a noose around his neck... er... revenue stream. For the outrage mob hath no reasoning and logic is not within it's grasp. Even now, the LGBT community of Lesbos and Feminists who believe women are not men go to war with those who believe in the Crossing Over. And yet crossing over implies two sides. Anathema to the high priests/priestesses/priesti? of the holy Sexual Spectrum. Even now do many nations contemplate calling all discussion of migration hateful. For hatefulness hath no definition and raw political manipulation is afoot. Cook falsely preaches that inclusion is achieved by excluding people who disagree. I do not that that word means what he thinks it means. They that voted for Trump and Brexit and wear yellow jackets are a warning and a sign and a portent to those who favour living in a safe walled gardens of complete agreement rather than the rough and stoney ways of civil compromise. For lo humans are unruly and safety is not a thing. Sadly, the false belief that "inclusion is achieved by excluding people" is all the rage these days. Read the Coc of your choice of you don't believe me. "For lo humans are unruly and safety is not a thing." Everyone believes that "inclusion is achieved by excluding people who disagree". The only people who don't are armchair liberals who've never had the opportunity or the need to make the choice. But even J S Mill would agree that tolerance must have its limits. What people argue so bitterly about is on what grounds people should be excluded. Some people believe it's people of certain political views. Some people believe it's foreigners, or fundamentalists, or Muslims, or non-Muslims, or people who don't speak a certain language, or people who speak it with the wrong accent. "Excluding people" is the basis of all communities and all politics, everywhere, ever. Only when you've specified what people you're excluding, will people know what kind of community it is. "Everyone believes that "inclusion is achieved by excluding people who disagree". " This is classic doublethink, and not true. Not true at all. What everyone believes is that "there is us and there is them. "We" are the group. "They" are outsiders. The group excludes the outsiders. This is not inclusion, no matter how hard you squint at it. But I guess it makes people feel good about excluding people ... "We're INCLUSIVE, so it's OK to exclude people! Especially THEM!". I hope you enjoyed writing that as much as I (and I hope others) enjoyed reading it. Bit more smiting next time perhaps? ""I sometimes say that I worry less about computers that think like people and more about people that think like computers, without values or compassion, without concern for consequences,"
--- Spoken during a humanitarian award acceptance speech from the guy who presides over technology theft, pays way less than a fair share of state/federal taxes, renditions all the dirty, toxic work done in China by underpaid, suicidal labour and has the balls to charge hipsters 500x to look cool while they are creating and social justicing. "Apple CEO decries the sins and moral turpitude of all tech companies but his own". Actually, didn't Jesus come out quite strongly AGAINST hypocrisy? Motes, beams, etc.? Does U2 count as hate speech? I have to confess, I say some pretty hateful things when I hear a U2 album. Or it's classified as "white supremacy" song? Actually, the holier-than-thou set who are constantly trying to find offense on the behalf of other people are trying to classify it as such. Sad but true. "Our own innate desire to separate right from wrong." Bwaaaahahahahahahaaaaaaa.... oh hell, my sides are hurting. Please, stop this. I can't take it any more! Honestly... no more.... this is hilarious. Seriously... we're talking comedy circuit gold here. Why is it that, whenever I see a photograph of Tim Cook, I am reminded of Paul O'Grady? Wasn't there something about a certain fruit in Genesis, that led to Original Sin? I think you'll find fruit is just what it was. The idea of it being an apple was just media garnish. All right, then how about the poisoned apple in Snow White? I'm sticking to this metaphor, you see. Not that the Apple Core Corp will soon go into the Sleeping Death. There was no apple in Genesis. Look up the difference between the Latin mālum and mălum. The Bible is full of such translation errors. Did you know that the translation of "Barabbas" is "Son of the Father"? In other words, BOTH guys on the stand claimed that moniker ... What if the wrong one was put to death? Kinda gives credence to what happened three days later, no? 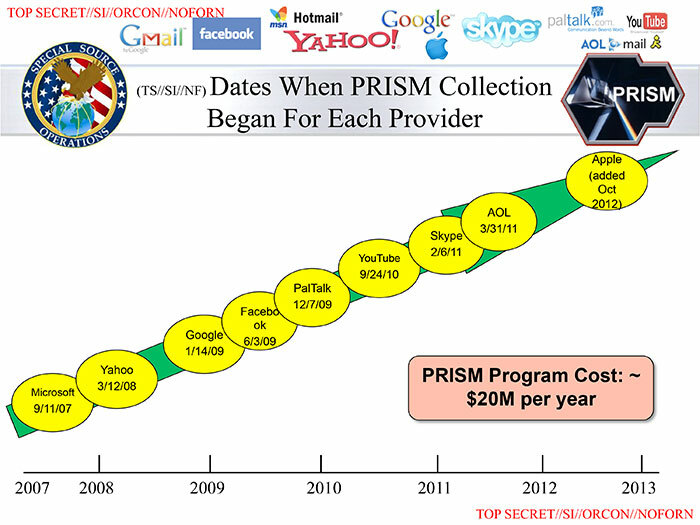 ... the virtuous Apple ever had anything to do with Prism.